Sunday may have been the inaugural LA Loves Alex’s Lemonade food event for Alex’s Lemonade Stand Foundation — a charity dedicated to fighting childhood cancer — but you wouldn’t have known it was the first time by sauntering around the beautifully laid-out event. Unlike most food fests which are usually crazy feeding frenzies and absurdly long lines, there was something intimate and lovely about this one. Maybe it was the red-and-white checkered picnic blankets spread out on the lawn, the live band or the actual lemonade stand manned by adorable rugrats at the entrance, but it felt like a family picnic at the park. In a good way. However instead of Mom’s over-mayo’d potato salad and Pop’s dried-out bbq skewers, we gorged ourselves on Food Network hottie Giada de Laurentiis’ pasta ponza and Pizzeria Bianco’s seasonal antipasto (bummer it wasn’t pizza). Craftsman and Sierra Nevada brew replaced ice-cooler standard PBR to wash down the tasting portions. 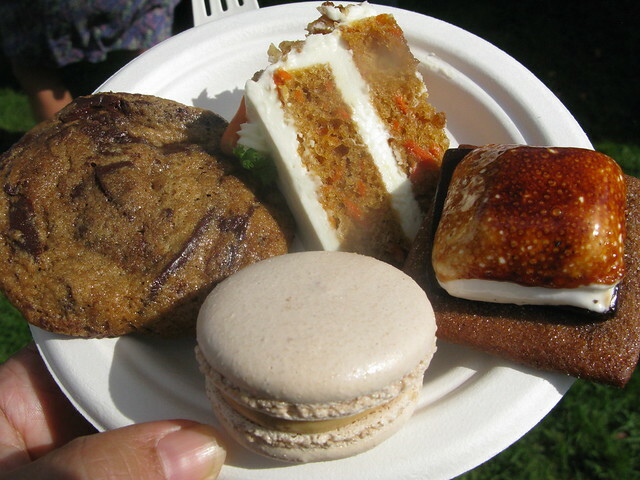 For dessert we had a choice of Zoe Nathan’s cinnamon sugar beignets, the Tavern’s smores or Nancy Silverton’s gelato. Oh, who am I kidding, I had them all because why choose just one? And we even got to rub elbows with honorary chairperson Jennifer Garner and master of ceremonies Jim Belushi. But the real highlights for me, not to downplay the awesomeness of all of the above, were the libations. Hungry Cat was serving up delicious cocktails. A refreshing change from what you usually find at food events: sponsored non-stellar cocktails served up by thin actress/model types with the limp shake. But here we had folks who knew what they were doing shaking up Hungry Cat’s seasonal drinks like the Howling Wolf made with Sazerac Rye, chili-infused tequila, honey and blood orange juice as well as the Comfort King with light and dark rums, persimmons and rye. Good news? Both these drinks are available at the Hungry Cat restaurants for this season. Huzzah! Craftsman's Mark Jilg manning the taps. 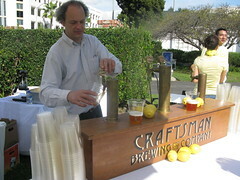 Also, Craftsman Brewery had seasonal and year-round beers on draft with brewer/founder Mark Jilg manning the taps of 1903 Lager, Poppy Fields, Sour and Fireworks Saison. My fave was the Triple White Sage, a light and very drinkable beer. Unfortunately, Craftsman was only available in the VIP section. Regular ticket holders had to content themselves with Lagunitas and Sierra Nevada beers, which is not necessarily a bad thing! 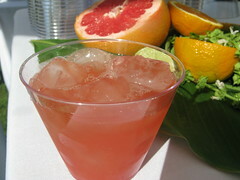 Suffice it to say, this culinary event was a job well done by the folks at Alex’s Lemonade Stand Foundation. I so can’t wait until next year’s fest, when I’ll spend all day there and make sure to employ a designated driver. By the way, if you’d like to contribute to this important foundation, you can either donate here or apply for volunteering opportunities here. I loved it! All of it. I totally paced myself and was able to get all the tastes in. Although I did miss the shrimp on risotto thing. And yes, a DD next year would be even better! The cocktails were great. I liked the spiciness of the Howling Wolf, but loved Cure’s cocktail too. Well, I actually live within walking distance so could have totally just done that if I didn’t have another event to go to right after. Next year? No double booking!